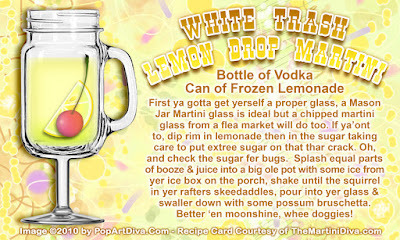 WHITE TRASH LEMON DROP MARTINI - Fer Yer Moonshine! Do you have your old sofa on the porch outside? Is your last car still sitting in your driveway - up on cement blocks? Can you read the daily news on your curtains? 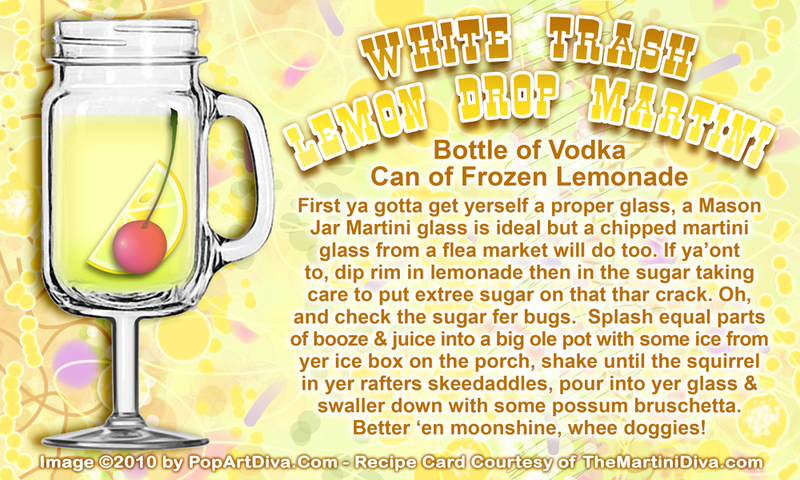 Then this might be the cocktail for you: The WHITE TRASH LEMON DROP MARTINI - a mouthful of moonshine mayhem in a mason jar on stilts! Yee-Haw! Even the banjo playing kid on that porch in Deliverance could shake this martini up - it's simply vodka and lemonade concentrate garnished with a dash of hee-haw. I'm dedicating this martini to my friend Debbie - it was entirely her idea! Suddenly last Saturday she found herself delightfully alone in her home, no man, no kids and no one bugging her. She had a day of "me time" bliss and wanted to celebrate with an hour of chillin' and a martini. Sadly, she had been eaten and drunk out of house and home by the above mentioned man and kids - her larder boasted only an almost empty bottle of plain vodka and a can of frozen lemonade. When I called her she was happily sipping what she called her "White Trash Lemon Drop" martini - I immediately pictured a mason jar drinking glass on a martini stem - I cracked up and promptly told her I was stealing the name! I think I'm going to have to do a series of redneck - hillbilly martinis now. . . anyone know where I can get my hands on some moonshine or Everclear? ?